Born 1964 in Palo Alto, USA. Lives and works in Phoenix, USA. Angela Ellsworth explores the body as a site, through various contexts and constraints, along with religious and social expectations. 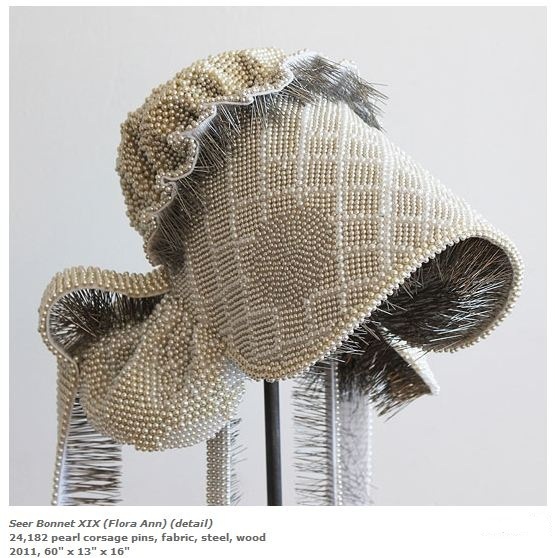 The series Seer Bonnets: A Continuing Offence (2009-2010), refers back to Ellsworth’s Mormon upbringing as a child. The bonnets are made to resemble the traditional pioneer headpieces worn earlier in Mormon history. 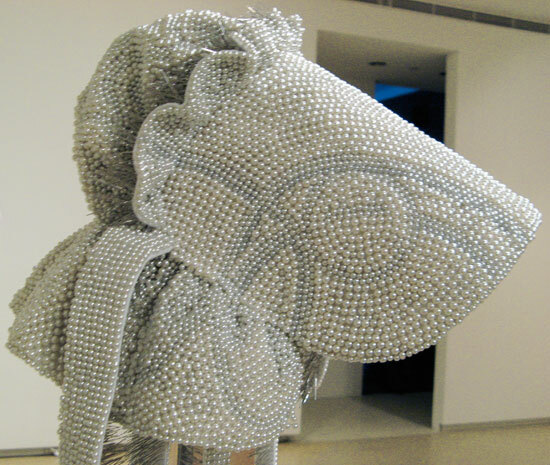 These sculptural pieces are made from fabric and thousands of corsage pins. 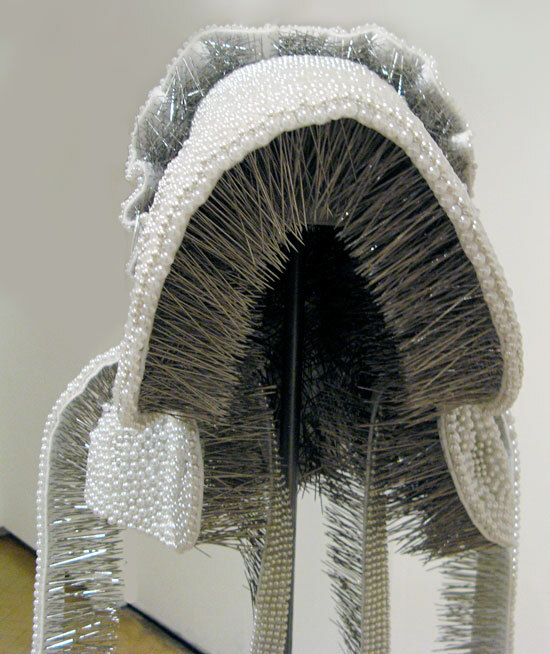 The pins decorate the outside of the bonnets with a pearl like exterior, whilst the sharp ends of the needle pins point to the inside of the bonnet, towards the head of the person that would be wearing it, making the artworks un-wearable, due to the pain one would be in trying to wear such an item. 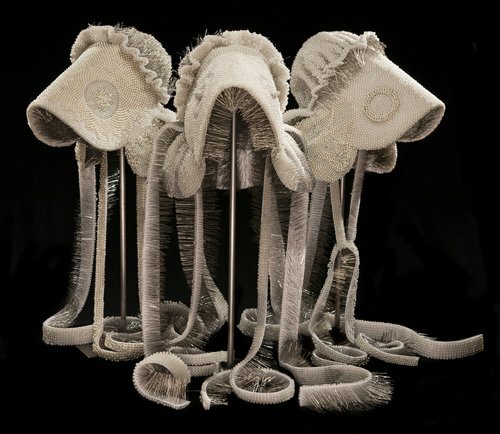 The outside of these bonnets are decorated in monochromatic patterns through the pearl heads of the pins, these patterns refer to occult Masonic symbols and Seer stones used by early Mormon prophets. The series title links back to Ellsworth’s great, great-grandfather, Lorenzo Snow, a Mormon prophet who was documented as having nine wives and imprisoned for multiple counts of unlawful cohabitation, stated by the courts as “a continuing offense”. These un-wearable bonnets are a visual metaphor for the “sister wives” living in the polygamous Mormon lifestyle. 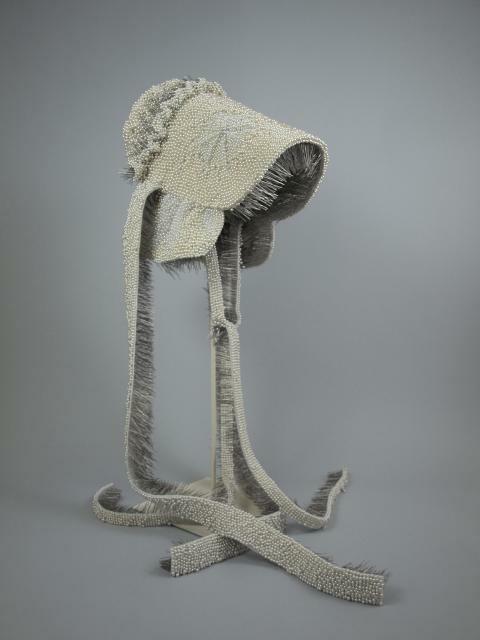 The use of pins in the artworks refer to craft and needlework expected to be done at home by the women of that time, who would live their lives in cruelty and submission, exploring notions of oppression and control within Ellsworth’s rejected Mormon heritage. thousands of pearl headed pins cover the bonnets in patterns and symbols resembling Masonic symbols and Seer stones used by early Mormon prophets. responds to the beauty and intricacy of the objects as well as the uncomfortable and painful feeling promoted by the sharp ends of the pins facing into the wearer. can walk through the space were the sculptures have been set up, allowing them to access the sculptures at every viewpoint. 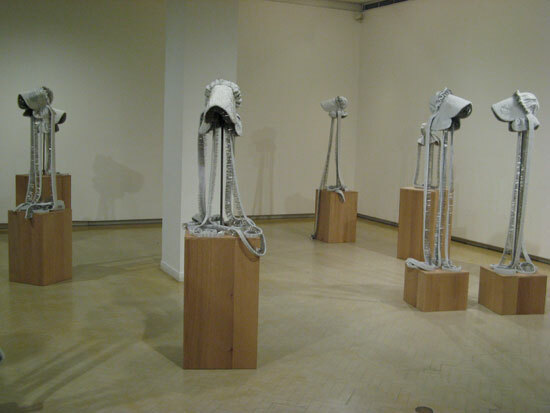 This entry was posted on 28/06/2012 by Emily Portmann in All, American, Installation, Sculpture, Textiles.